TRENTON, N.J. – Trenton’s Tony Franklin walked through the underbelly of Waterfront Park with the kind of easy smile reserved for managers confident in their pitching staff. Night after night, his Thunder pitchers have provided plenty of reason for Franklin’s calm. The game that followed Franklin’s comments offered a perfect example of why Franklin is so relaxed. The score may look rather ordinary, but Trenton’s 6-3 victory over Binghamton on a rainy mid-July evening was pretty much a microcosm of the Thunder’s season. New York Yankees major league pitcher Jeff Karstens was on the mound in the first inning for a rehab start, one of 16 pitchers to start a game for the Thunder this season. He struggled early to regain form. Binghamton scored a run in the first and threatened more, putting runners on second and third and just one out before Karstens slammed the door. Karstens lasted five innings and the Thunder bullpen pitched four largely uneventful innings to notch another win. 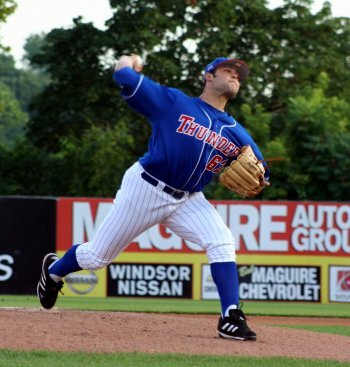 “It’s an unbelievably talented group of guys,” said pitcher Alan Horne, who is currently second on the Thunder with nine wins despite a 2.36 ERA. While Horne’s miniscule ERA is striking for a starter, it is pretty much the norm for Trenton’s staff. Despite the constant movement of pitchers threw the Yankees organization – 23 different pitchers have appeared for the Thunder so far this season – Trenton’s team ERA hovered around 2.60 until late July. While the Thunder have benefited from a few major league rehabbers – along with Karstens, Roger Clemens and Phil Hughes both started for the Thunder – most of Trenton’s success has been home grown. Jeffery Marquez, the only Trenton pitcher other than Horne to start 20 games this season, leads the Thunder with 11 wins despite having the massive ERA (by Trenton standards) of 3.15. Jason Smith and Brett Jones have both started more than 15 games, yet maintained sub-3.00 ERAs. The formula for Aldred’s staff isn’t complex. The starters pitch deep into games and a well-rested bullpen finishes off the job. While members of the bullpen aren’t always pleased with the lack of work, they don’t argue with the results. For much of the season the Thunder have been able to plug just about anyone into the rotation, although the likes of Ian Kennedy and Joba Chamberlain are hardly no-names. The two top pitching prospects in the Yankees organization joined the Thunder in early June. After allowing four earned runs in his first start, Kennedy never allowed more than two in any of his next eight en route to a 5-1 record and a 2.59 ERA. Chamberlain, the flame throwing righthander who has Yankees’ bloggers wearing out their keyboards, allowed seven earned runs in his July 20 start to see his ERA balloon to 3.43. Aside from that outing, Chamberlain been awing Thunder fans with his 100 mph fastball. Others, like Kennedy, have been wowing fans with their control. Kennedy and Chamberlain were recently promoted to Triple-A Scranton/Wilkes-Barre, but Franklin still has plenty of arms to lean on.